Since its invention, radio has driven innovation like few other technologies. Whether in the private or public domain, advances in wireless technologies have rapidly increased the number of connected devices and users that rely on accessing the RF spectrum. As a result, users are always contending with each other for limited spectral resources. If the environment is not carefully managed and controlled, this competition can lead to radio interference and greatly reduced quality of service. This is what you experience when your Netflix stream slows down, or sometimes when a call is dropped mid-conversation. But while this interference is inconvenient for personal and commercial applications, it can literally mean life or death in domains such as public safety, air traffic control, emergency services, or military. This can be best understood by thinking of the approaching autonomous vehicle technology. If interference, whether inadvertent or malicious, results in a loss of connectivity or disrupts the systems that keep the car on the road, an accident can happen in the blink of an eye. As IEEE states, connectivity is essential for reliable and safe autonomous vehicles. As RF spectrum becomes more crowded and new standards such as 5G lead to greater complexity, the potential for interference will continue to grow. All of these factors have made regulation and spectrum monitoring critical activities. As technology pushes onwards, regulators and government agencies will need new tools that provide greater versatility, better performance, and additional capabilities over traditional spectrum analysis equipment. Two of the biggest challenges for regulators as wireless shifts toward 5G will be performance and presence. 5G technologies are exploring the use of frequencies well above the traditional 6 GHz used today, and bands in the 27 to 30 GHz frequency range are the current front runners for new standards. Testing these waveforms will require new, flexible equipment, or downconverters that can integrate seamlessly with existing spectrum analyzers. These high frequency waves, known as millimeter waves, are also more limited in how far they can travel. 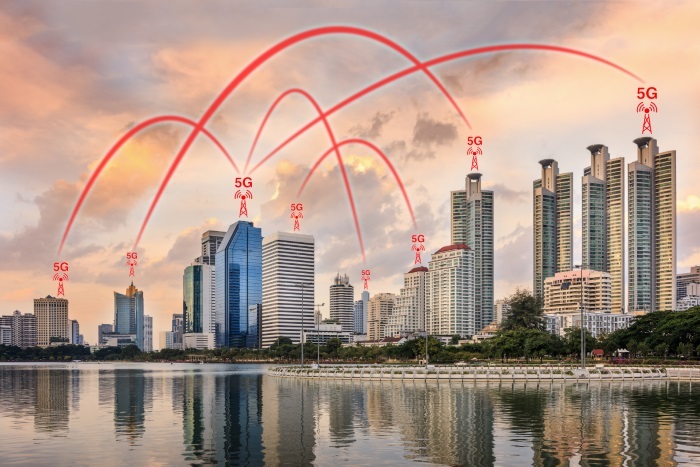 Combined with an exponential increase in connected devices, 5G networks will require many more basestations to provide consistent coverage. Current geographical challenges will quickly become significantly greater obstacles to effective wireless monitoring, especially in larger countries where it would be prohibitively expensive to roll enough trucks to adequately monitor the spectrum at any given point in time. Budget issues aside, there are simply not enough skilled technicians to operate the trucks required for effective monitoring using today’s methods. A new approach is needed. Software-defined spectrum analysis solutions are compact, powerful, and flexible enough to adapt to a changing environment. Some, such as the ThinkRF R5500 Real-Time Spectrum Analyzer, are networked for in-place and continuous monitoring. They can be deployed long term and accessed remotely either individually or in a distributed manner. Unlike traditional spectrum analysis solutions, they can be easily upgraded through software, and are flexible and versatile enough to handle any signal types. Paired with dedicated software running on a PC, users gain the ability to capture multiple disparate bands at once, record the data, and conduct deeper analysis. A key challenge to effective regulatory monitoring is determining the existence and severity of interference while it is occurring. In rolling out future technologies such as the Internet of Things (IoT), self-driving cars, and smart cities, a real-time understanding of the spectrum environment will be invaluable. Simply having the ability to effectively monitor, detect, and analyze signals in real-time will be a critical component in providing reliable and continuous spectrum access to these new technologies. With this real-time, continuous approach to monitoring, previously undetectable transitory signals can be captured and located to deal with interference quickly. In the future, these insights could be compiled, and big data analysis could lead to better prediction of interference before it occurs. Armed with this information, monitoring agents will no longer have to wait for complaints to roll in before investigation. The stakes are simply too high to ignore. Autonomous vehicles that are attacked or lose connectivity at major intersections could result in widespread collisions and loss of life. Damage or disruption to smart power grids could cripple cities and delay emergency response. IoT devices at large scale industrial facilities that lose connectivity could result in irreparable damage to critical equipment. All of these are very real and serious consequences of a lack of reliable spectrum access due to interference or other vulnerabilities. As the spectrum becomes even more crowded and wireless technologies continue to evolve, relying on reactive investigation and traditional, hardware-based spectrum analysis equipment will not be enough. Powerful, versatile, and software-defined spectrum analysis solutions are designed and built for the monitoring applications of the future, and provide a much needed alternative to traditional equipment.